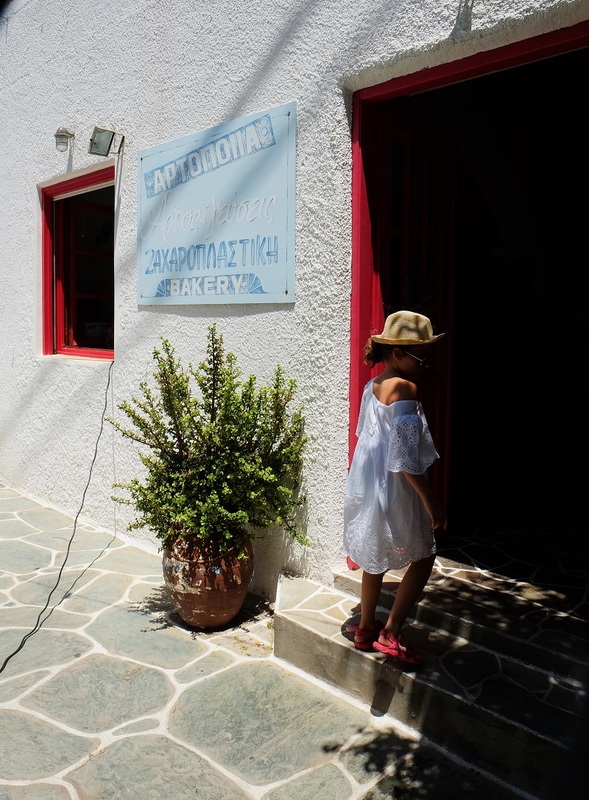 My friend Pepi, from the stylish, Athens-based boutique Alice on Board, has written a travel post on the Greek islands Sifnos and Serifos for us before, which left me dreaming of romantic white villages, beautiful sandy beaches and a sea as blue as sapphires. 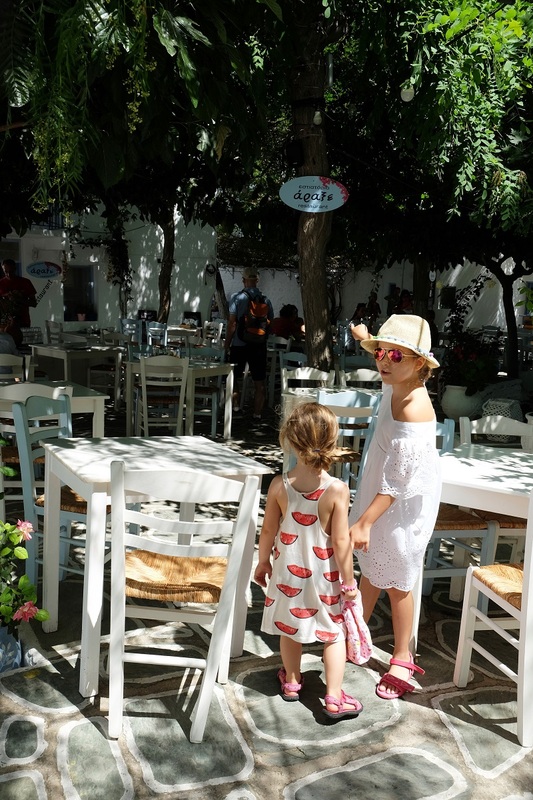 And made me adamant to plan a family visit to Greece soon! 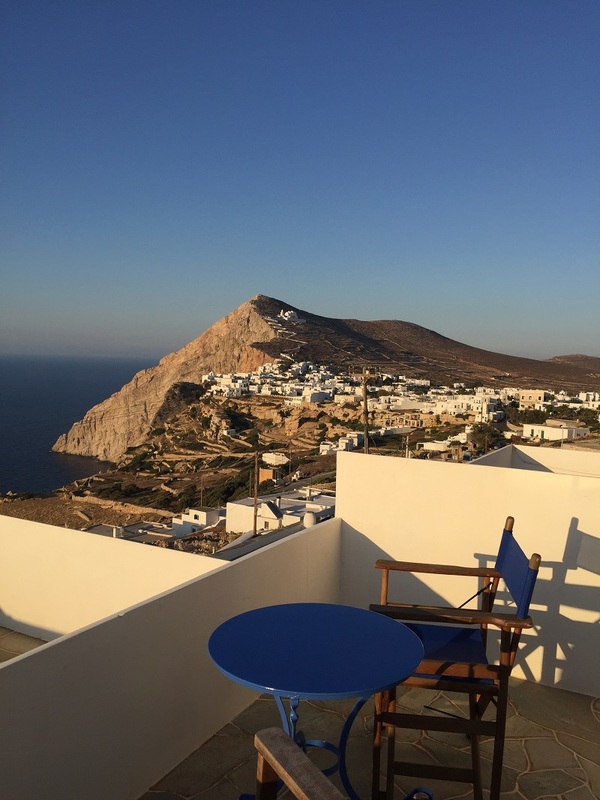 Pepi has written another island review for us, this time of the island Folegandros, which is again so incredibly dreamy… Thank you for sharing your beautiful country with us, Pepi! Time flies fast but steadily. 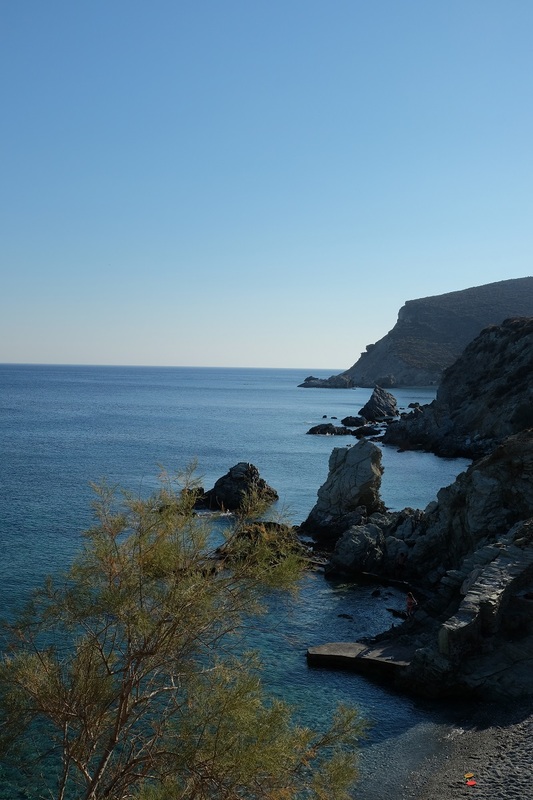 My first visit to the island of Folegandros, as my computer photo-files reveal, took place back in 2003. 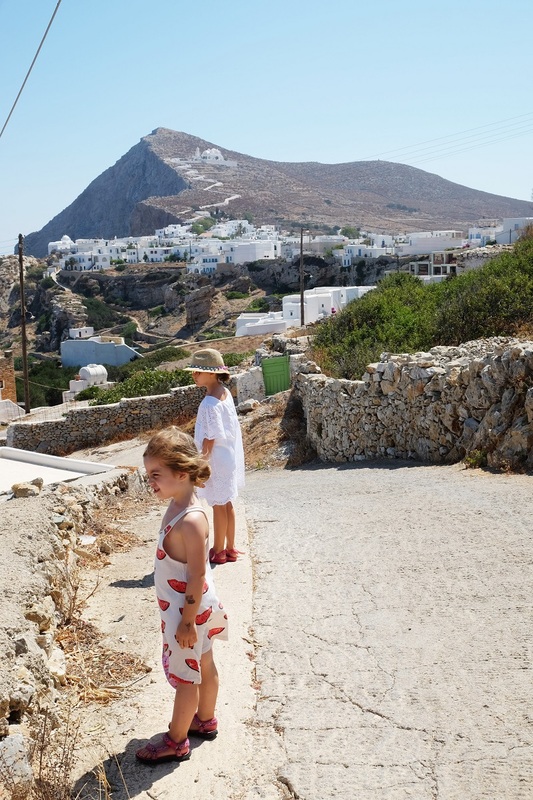 Although it started as a Cycladic island of barren land, there has been rapid development over the last 10 – 15 years, a little scary I would say, with several visitors who either loved the island or never visited it again. It has its own rules and its own identity. If you try to change it, even a little bit, it will push you away calmly and simply, just as warmly as it welcomes you. Folegandros is an island that I simply adore not only because it has the most beautiful Chora of the Cyclades (note: Chora is a white and very picturesque cycladic village, full of stairs and narrow paths that make it inaccessible for cars of any kind), and certainly not because of the small number of beaches, not even due to its few villages. It is because every time it quickly removes the city stress — every time I ascend on the paved path over to Agali beach, I feel that the sea hugs me and I want to stretch my hands and shout. (I did it this year with the little girls and I enjoyed it!) When I wander along its narrow alleys, I feel like being a local, I feel I belong there. 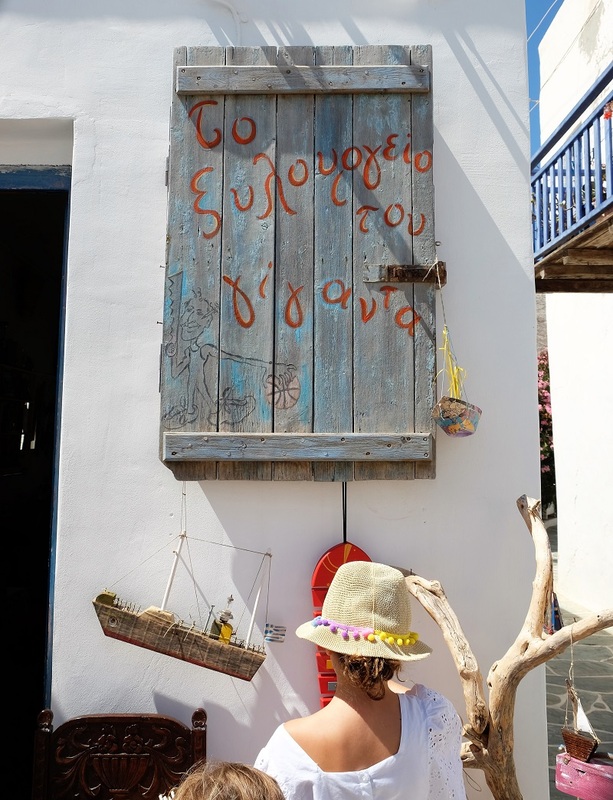 Every time I come to the island, since that very first time in 2003, I leave a little bit of myself behind as a “souvenir” in order to collect it the next time I will come back. 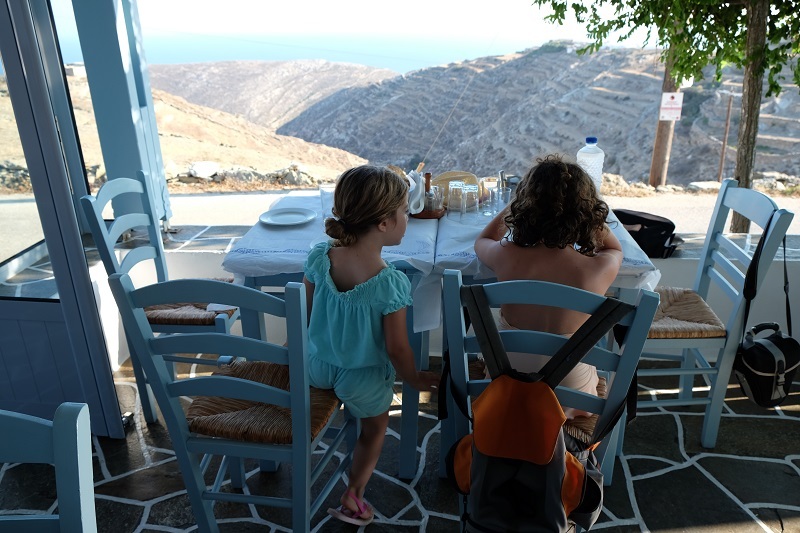 I was craving to introduce Folegandros to my little ones. Initially, I was reluctant because of their young ages, but we were proved wrong. 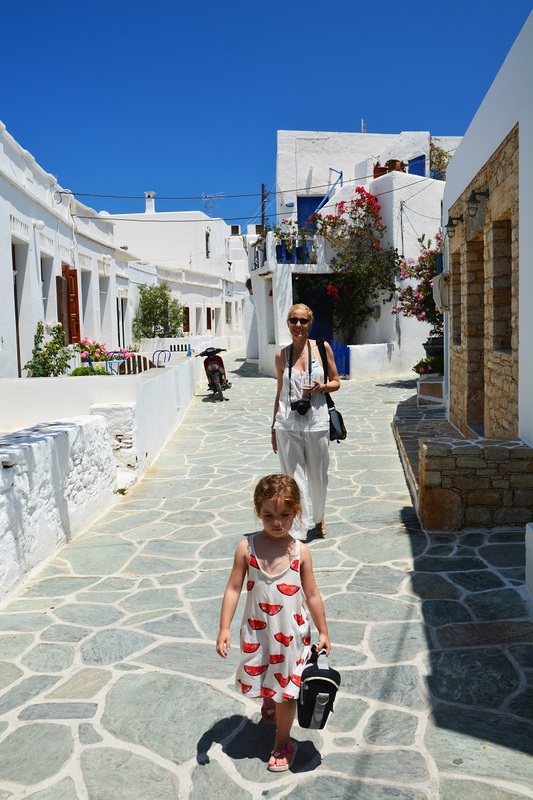 We enjoyed our four days on my favorite island and I wished they had last a little longer. 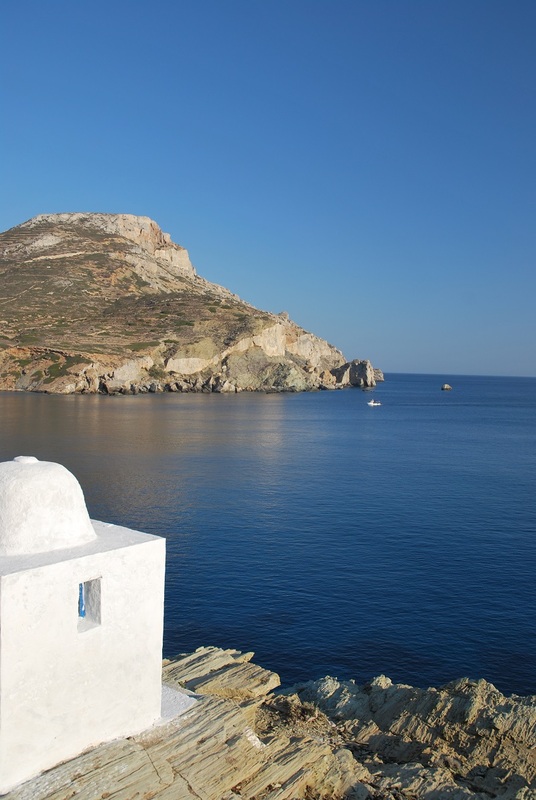 Personally Ι award it as the best Chora of the Cyclades. 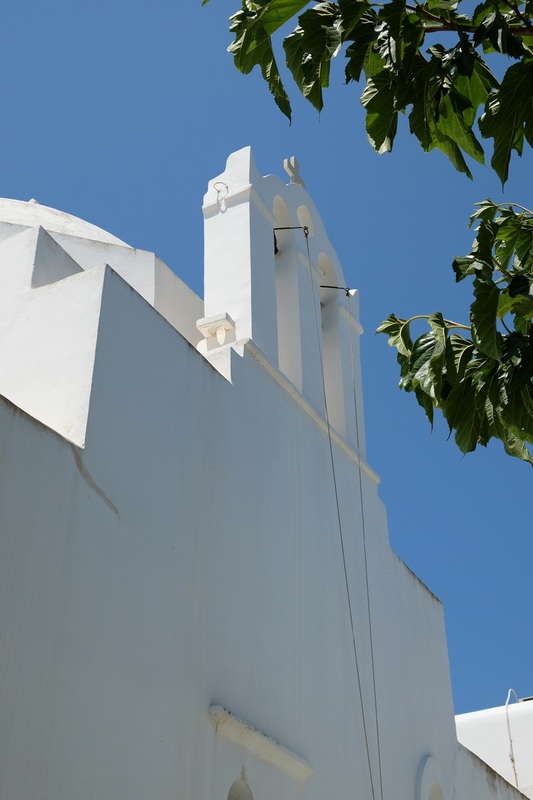 Inaccessible by cars, the town of Folegandros is perched at 200 meters, overlooking the sea, while above it, on the right, the imposing church of the Virgin Mary is situated, and really you can’t miss this ride, especially at dusk. In its center, the 3 large squares, as if holding each other’s hand circularly, they shape the unique character of Chora. Everything is clustered there. 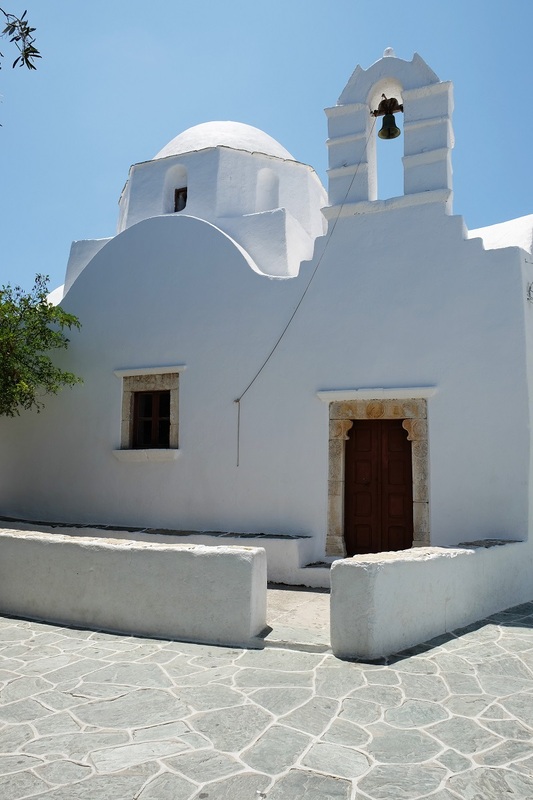 The Punda Square, the large balcony to the Aegean, is followed by Ntounavi Square, with its big trees, in the company of Saint Nicholas and Piazza Square. 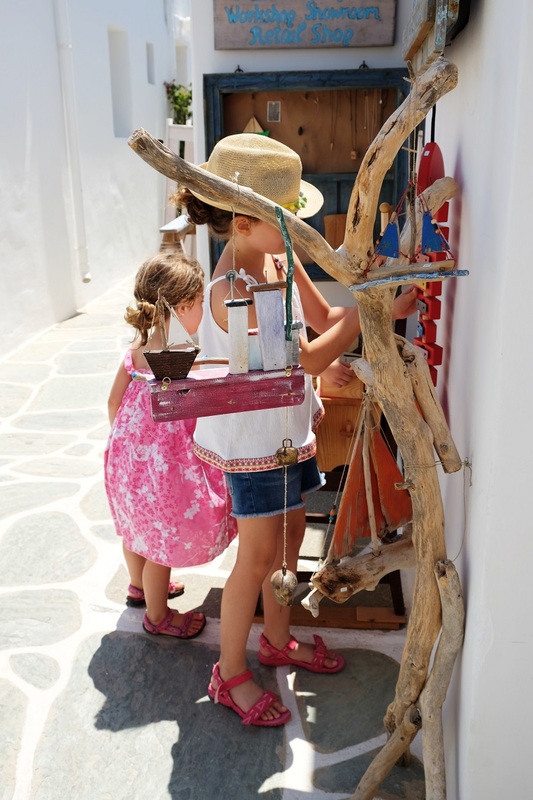 There are small and stylish shops, such as the woodworker “Giganta” for handmade toys, and the “Stolidaki”, all quite elegant for shopping. And then there are the restaurants, the bakery, the supermarket. Here is also the entrance to the Castle. From Paraporti, it is like entering into another era. Here the hallways, always clean and whitewashed, are still used as seats for a rest if you want, like in the time that they were built, in approximately 1215. In recent years, the island has seen a major construction development. Every year new hotels appear, with very minimal aesthetic and very high prices I would say. It is one of the reasons we choose to visit the island in June or July and never in August. 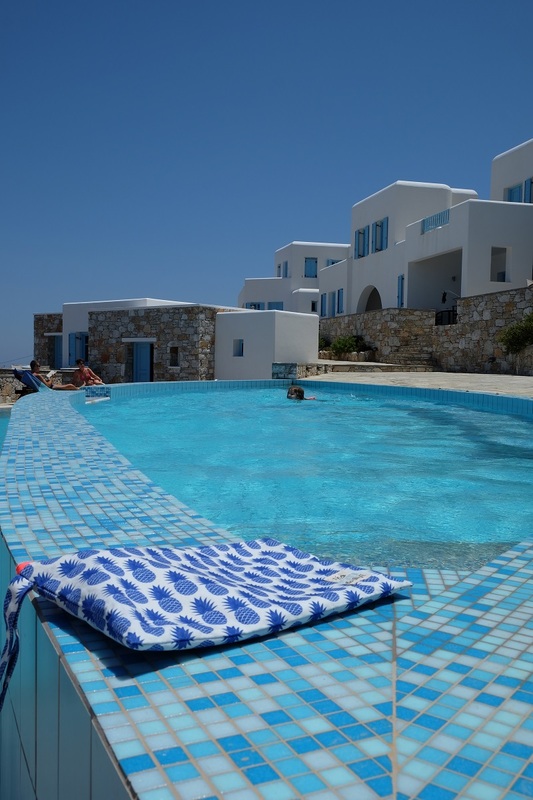 In the past, we have stayed in “Anemousa”, a “simple” hotel which recently built a swimming pool, but has a wonderful sea view (and is located above “Rakentia” – I still remember that wine just before sunset). 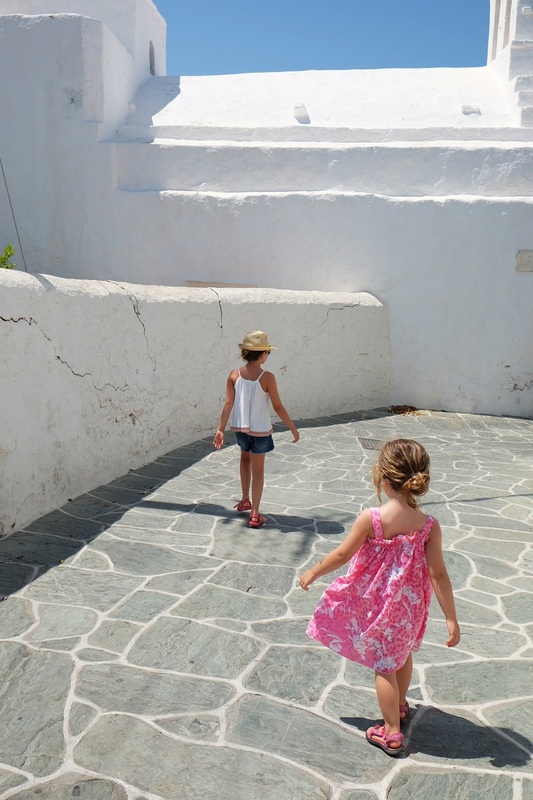 This year, we stayed in Belvedere, a hotel in an amazing location but with only one problem – it has a large hill to be reached there and so we were forced to take the car (only for the ascent, since together with the little girls we were always walking downhill). The hotel does not have its own swimming pool but you are free to use the “twin” hotel “Mira Mare”, which is located next door. 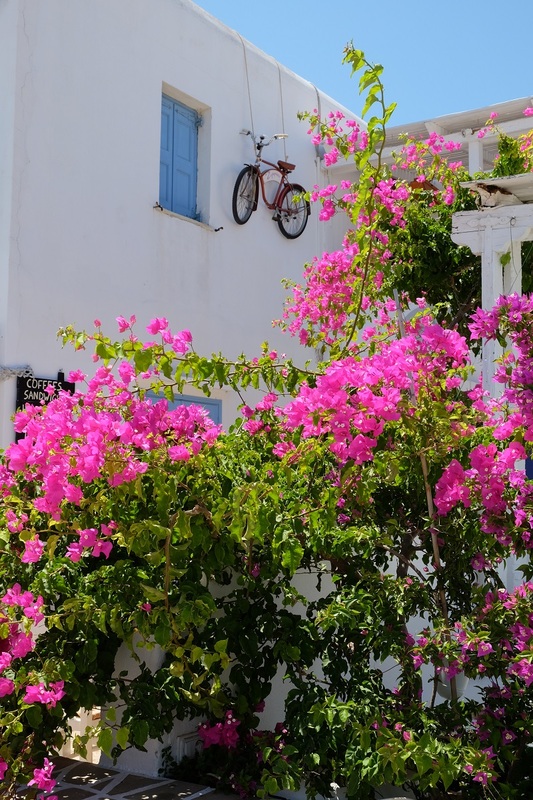 Simple rooms with magnificent terraces overlooking the Chora, and a very helpful owner who has cared to provide you with showers, in case you depart late for Piraeus and in order to avoid being charged for another day – I really enjoyed that shower. 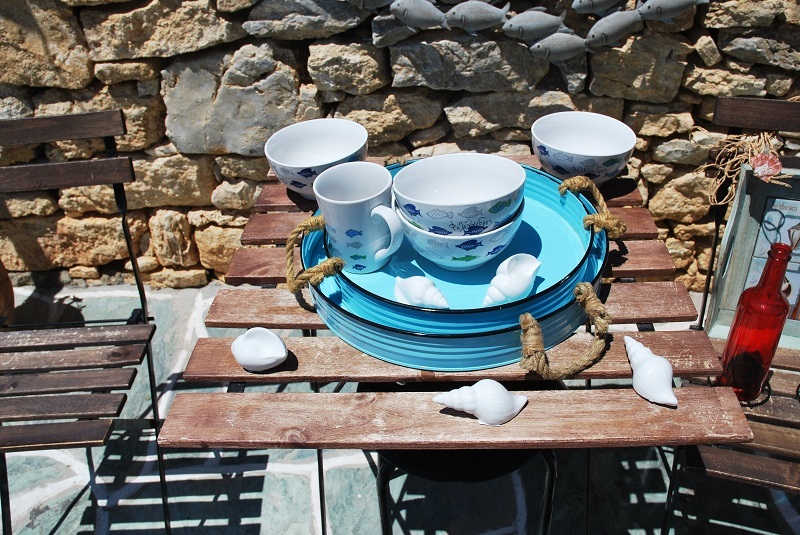 If you go to Folegandros, there is no way not to try “Matsata” – traditional handmade pasta. Much like noodles, but cooked immediately after preparation. They are not sold in stores, but you can find them in the restaurants, where they are served with either typical red sauce, or braised meat, rooster or rabbit. As always, we visited Ano Meria, at the “Sinantisi”. The portions were huge, which is why we shared. 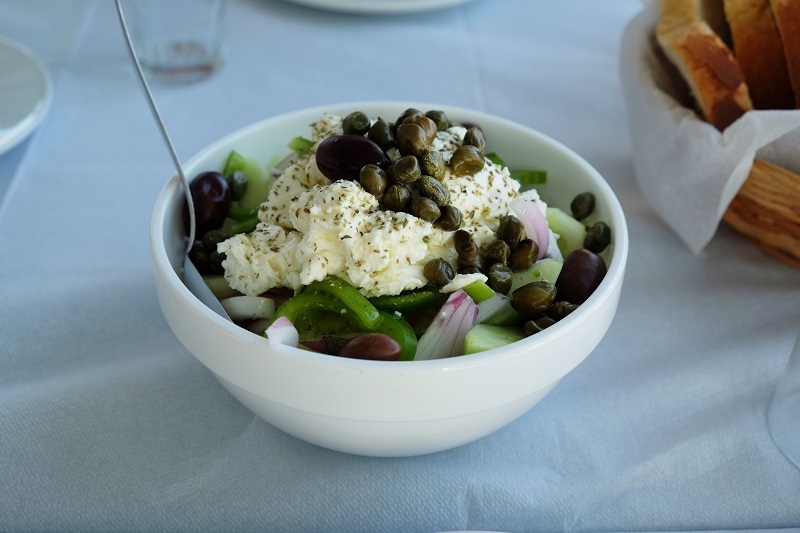 And we also ate Greek salad, always with souroto cheese (a soft white cheese) – the second best local food in Folegandros, after “Matsata”. 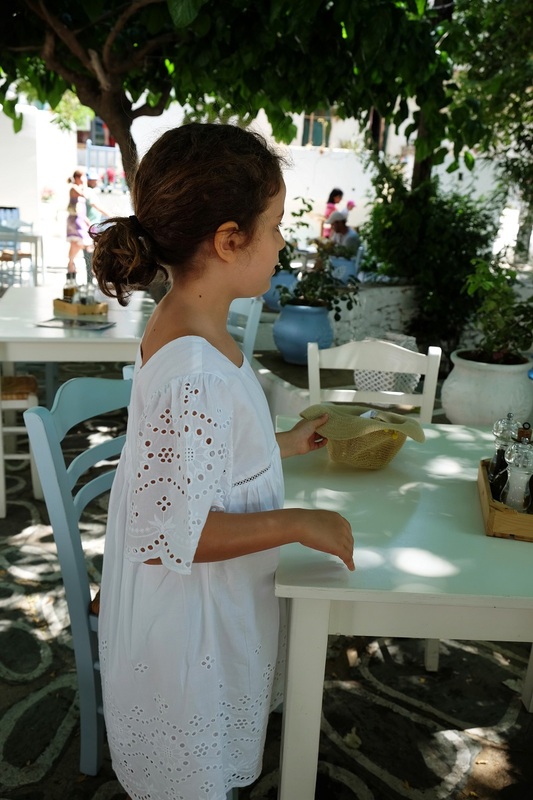 This year, in our discoveries, we have added the Maragkoudiko at Ano Meria, which offers amazing baked delicacies (wrapped, straw, spicy sausage) – if you find yourself in this place, definitely pick a “souvlaki”. 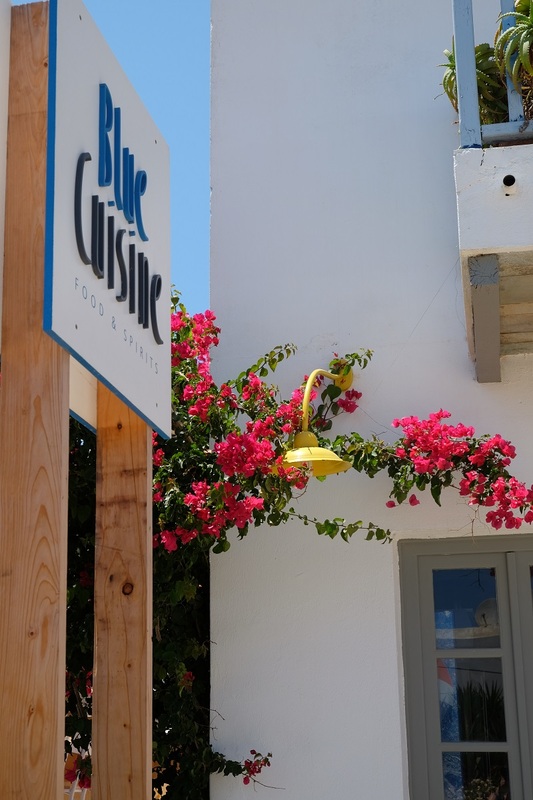 There are many restaurants to eat in Chora and this year I discovered a new arrival, the Blue Cuisine; every time we passed, it was full. However, we ate deliciously in Chic, in the Piatsa, in the Kritiko and Spitiko. 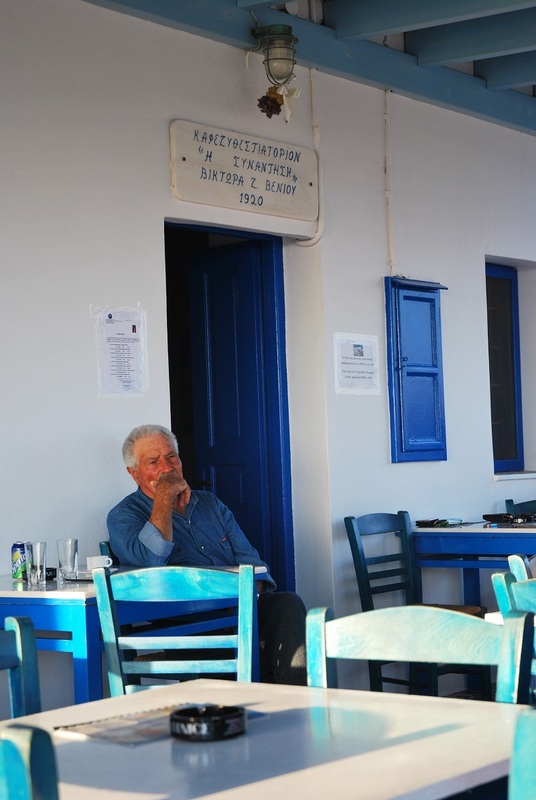 Οur breakfasts were also always the finest. I love the square and the “Araxse” place (although they never give receipts and they are always a little moody); the spot under the trees and the quality of the breakfast are unique. We greatly enjoyed our scrambled eggs and our yogurt while making our daily plans and letting the girls run around the trees, playing various street games. 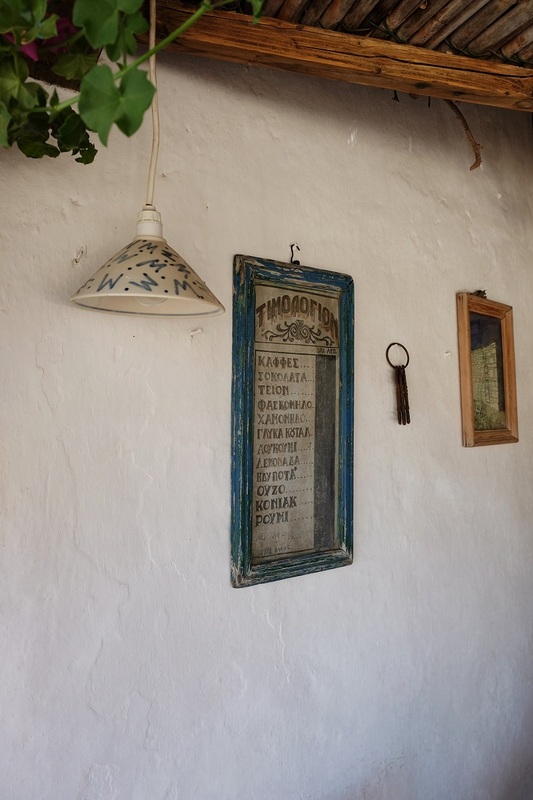 Another spot that stands out is the wonderful garden of Pounta. Whenever I go, I feel like I’m in my grandmother’s garden. Small kittens always keep you company and the people are always companionable. 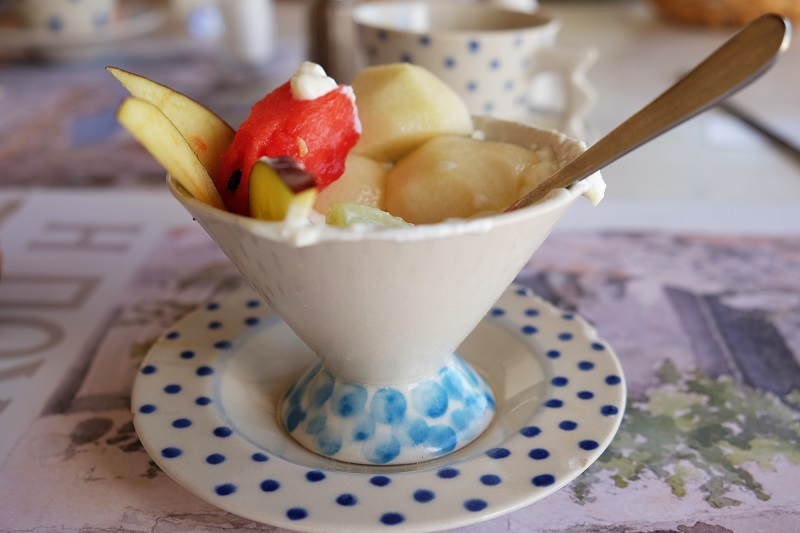 The yogurt with the fruits is especially unsurpassed. 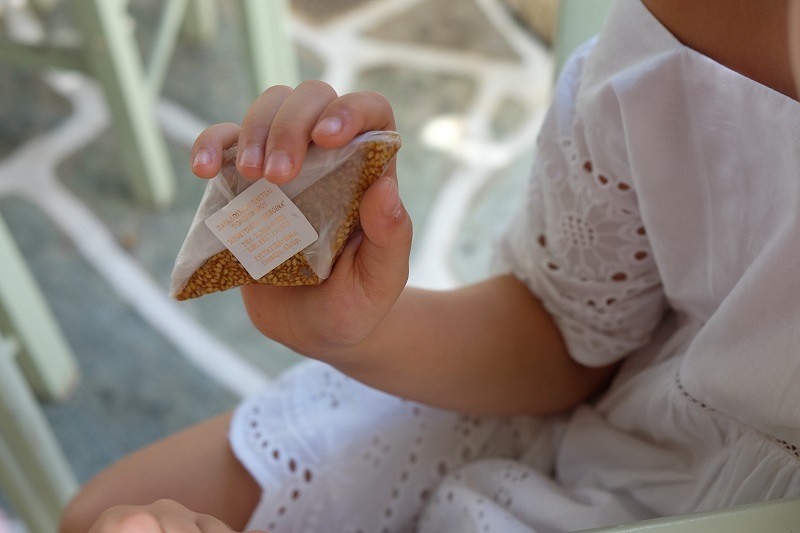 And every morning, just before leaving for our daily program, we were passing by the baker for the classic “kouloura” with anise and for the “pasteli” (sesame seeds with honey). 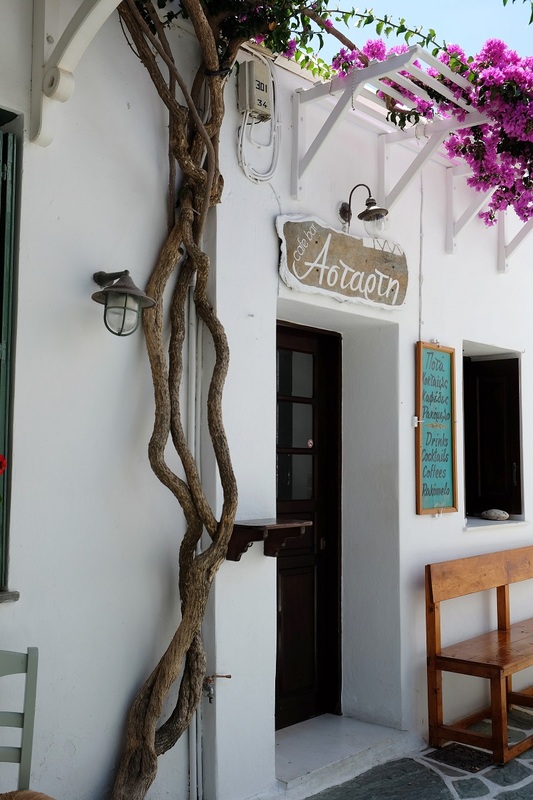 For a drink early afternoon and all night long you should definitely have a stop at “Astarti”. This time we only swam in Agali. 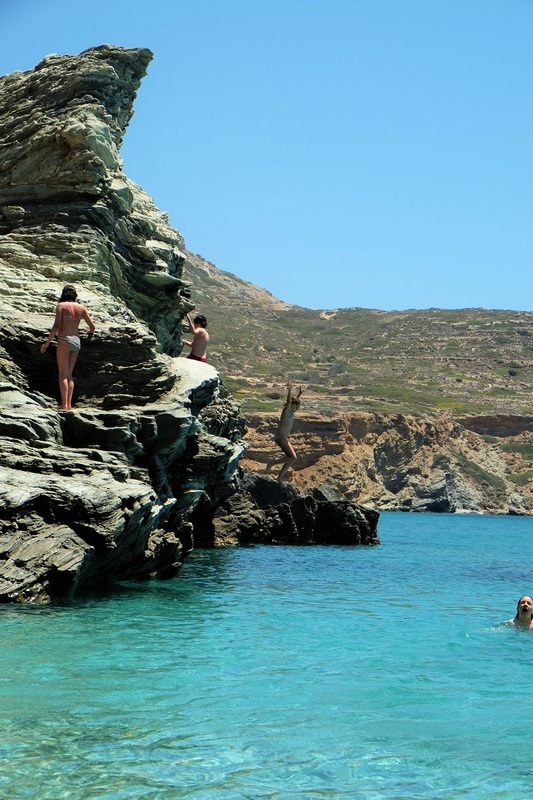 Here you can find the rocks that every summer welcome aspiring young climbers with different heights for everyone – even Valia jumped. And certainly, we couldn’t resist hiking. 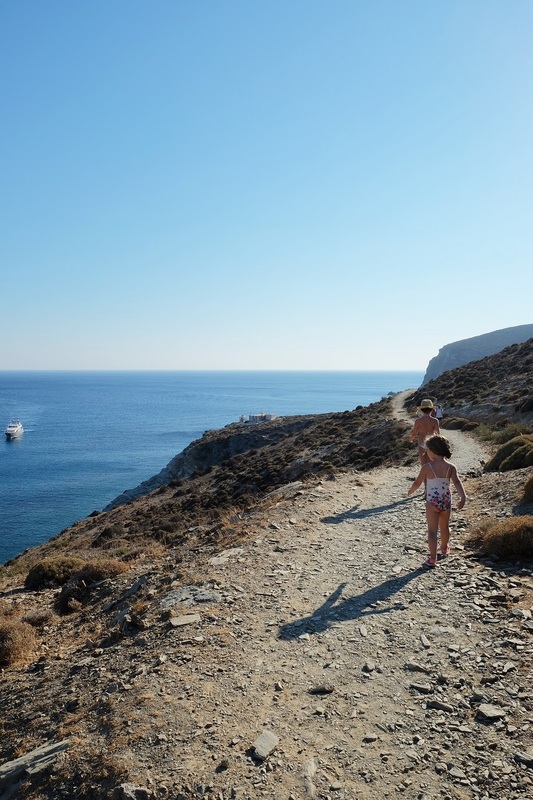 From Agali, the dirt path was waiting for us in order to lead us to Galifos (with its rooms without electricity and its small, magical beach) and to continue to Agios Nikolaos beach. 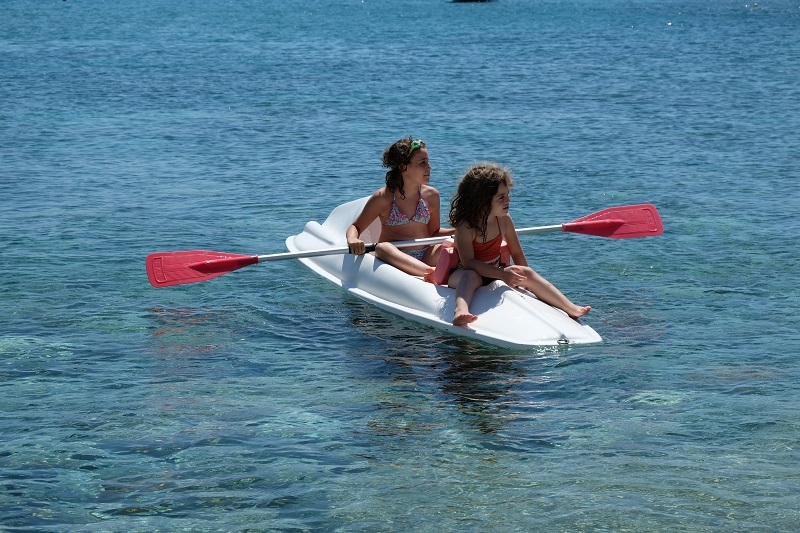 The island has some other beaches, like the Katergo beach and the Livadi beach, where one can easily visit by boat. We left but we will definitely be back. 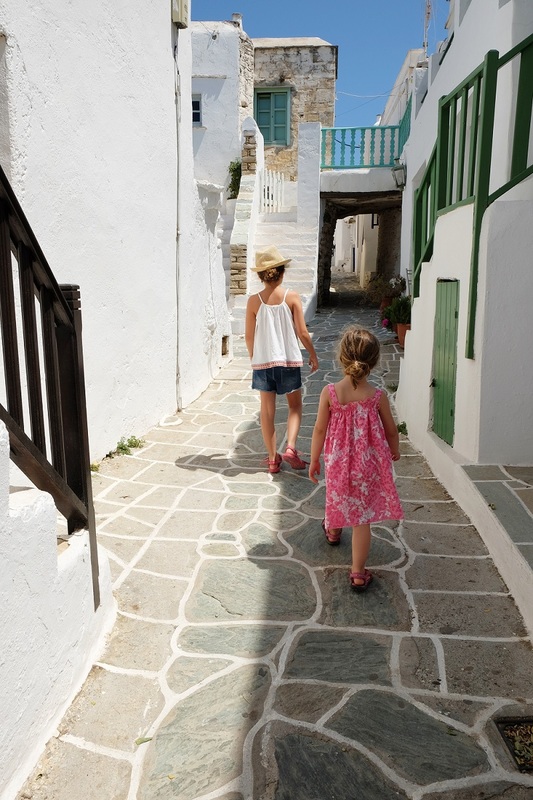 The little girls loved this island that has hosted us so many times. This island where you can find tranquility without being alone; this island where you can rest, even if you choose to travel for a while in its highlands. It is the island that every time I will return to in order to get that little piece that I left behind the last time. 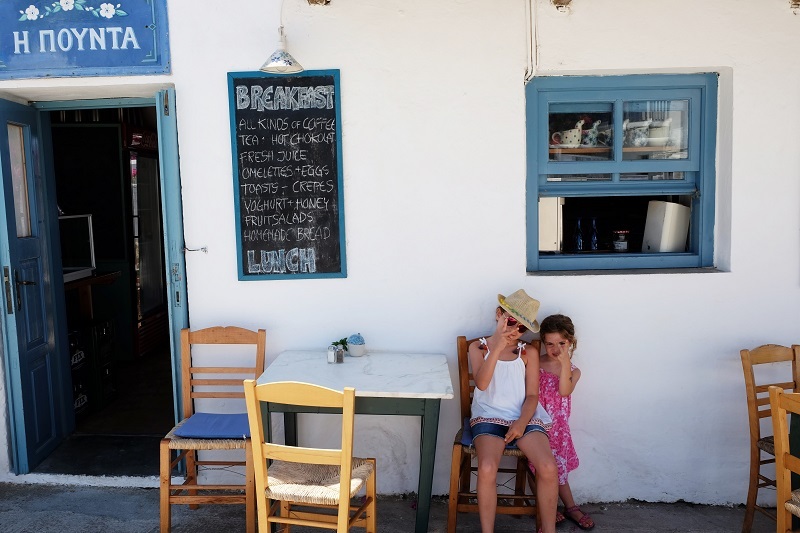 So lovely to hear about a different island in the Cyclades and such beautiful photos…definitely going on my list. Terrific post. 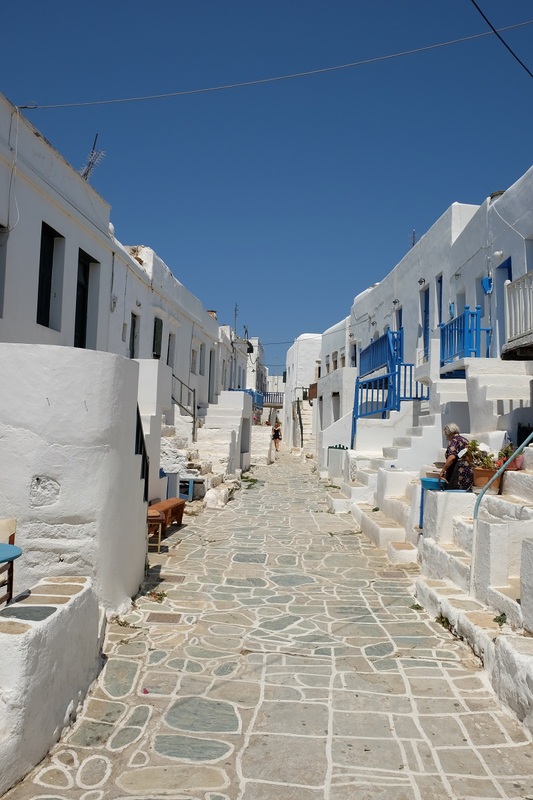 I’m in Folegandros now. My new fav island.